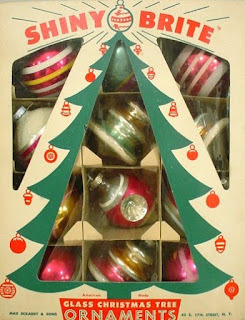 Shiny-Brite ornaments are a perfect example of Mid-Century Christmas decorations. The great ad, above, is from 1966. These ornaments date back a little earlier, though. 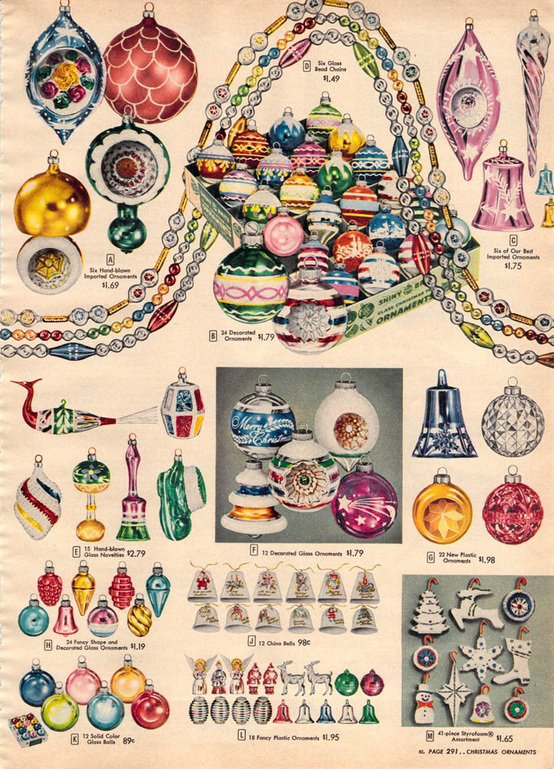 The first Shiny-Brite ornaments were made in 1937 by Max Eckhardt. He worked with the Corning Glass Company to produce them. 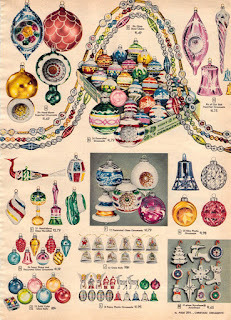 These ornaments were originally sold at Woolworth dime stores. Shiny-Brites were popular during the 1940's - World War II vintage - because they were American made. The 1940's box top featured Santa Claus shaking hands with Uncle Sam. The ornaments were originally manufactured in New Jersey. They were sprayed inside with silver nitrate and then they were lacquered so they truly had a shiny and bright appearance! Not all vintage glass ornaments are Shiny-Brites. You will recognize them by the Shiny Brite name on the metal ornament capper. During World War II this capper was made of cardboard because of war time manufacturing restrictions. This 1956 Sears catalog page features Shiny-Brites galore. The variety of designs was fabulous -- balls, tear drop shapes, bell shapes, indents, birds, and more! The company stopped production in the 1970's. However, in recent years Christopher Radko has started producing Shiny-Brite ornaments, and his selection is always lovely. Do you remember Shiny-Brite ornaments? Were there any of these beauties on your childhood Christmas tree? I would love to hear from you in the comments, below. 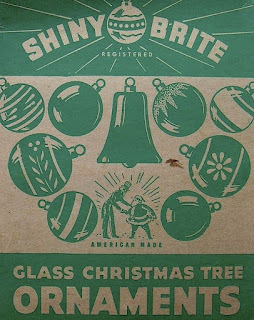 I don't remember Shiny-Brite ornaments, I might be too young, but I enjoyed learning about them! Yes, I think my mother had some of these for our tree. But I never knew there was anything special about them. How interesting that things we assume are just ordinary become part of history. Thanks for sharing this interesting story. What a wonderful memory. My mother had all Shiny Brites for our tree growing up. How beautiful these ornaments were! I have to admit though, with a little one I'm very thankful for today's pretty, shatter proof ornaments. These would make a lovely old fashioned tree. I love vintage EVERYTHING!! These are so pretty! I recently mentioned the Shiny Brite ornaments in a blog post. I still have some hanging on my tree that belonged to my Grandma. Sweet memories. They are such pretty ornaments! I really like them! Ooh, they're so pretty, but I've never heard of them before! I love the look of them! Thanks for visiting! I loved reading your comments, and enjoyed your Shiny-Brite memories. I have some Shiny Brites on my tree and I've sold quite a few over the last 10 years. thanks for a great "walk down memory lane"